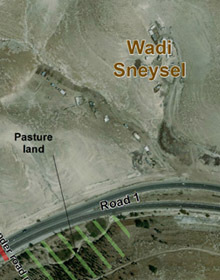 This residential area is located north of Ma’ale Adumim, north of Road No. 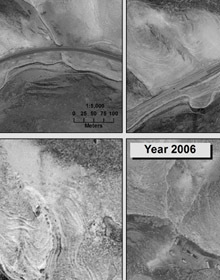 1, within the jurisdictional and planning limits of the settlement. The community arrived originally from Tel Arad, from where they were deported at the beginning of the 1950s. At first they settled in the South Hebron Hills in the area of Masafer Yatta, until they moved, in 1952, to the East Jerusalem area. In 1967 they moved to the area near Um Rassas, known today as neighborhood “07” of Ma’ale Adumim. Since the end of the 1990s, residents have waged a bitter struggle against being evacuated to Al-Jabal, an evacuation that was ultimately carried out, as a result of which there are a number of families formally registered in Al-Jabal that are actually living there. The lands they occupy are recognized as private lands belonging to Al-I’sawiyya, and they reside there with the owners’ agreement, but all of the lands are among lands expropriated in 1975 for the establishment of the Ma’ale Adumim settlement. Demolition orders were issued for all of the buildings there, but in effect, while no homes have been demolished, residents are not building new structures or adding to any existing homes. The flocks serve the residents for home use and for commercial production, based on demand, when customers visit the locality to buy products. 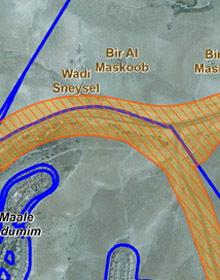 Roads to the locality are in disrepair and difficult to travel, limiting accessibility, and although public transportation passes along the nearby main road, drivers are prohibited from stopping in the area. In most cases, residents succeed in finding transportation in the direction of Al-E’izariya, but it is more difficult to find return transportation, since as stated, in most cases the drivers do not stop at the Bedouin localities.